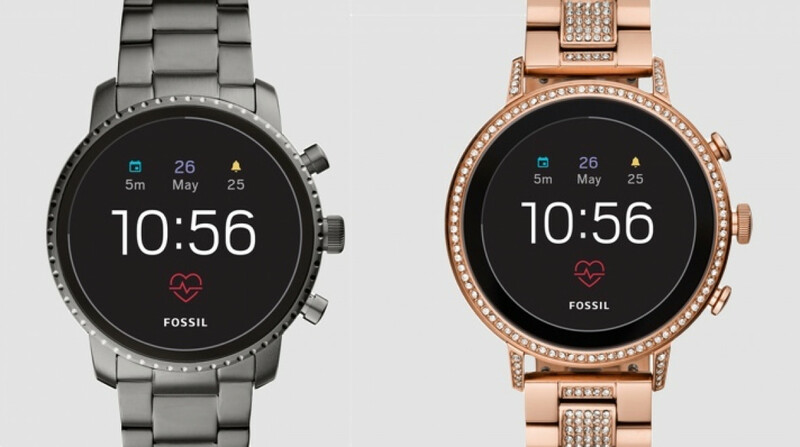 We had a pretty good idea that a bunch of new Fossil Wear watches were incoming and we now have our first look at the company's fourth generation Wear smartwatches. Say hello to the Fossil Q Venture HR and the Fossil Q Explorist HR. Building on the third generation Venture and Explorist watches, which were announced last year, the name gives us our first big clue as to what new features are being added. Yes, you can now monitor your heart rate, with both watches letting you take manual heart rate readings or add that extra layer of fitness data when you're going out for a run or hitting the gym. Along with the inclusion of a heart rate sensor, exclusive watch faces will now also let Venture and Explorist HR owners access manual readings straight from the watch face, too. Another big addition is NFC, which is something we had anticipated was going to get thrown into the mix. That's a big deal because it now means you can access Google Pay to make contactless payments from the wrist. It's a feature we'd been asking for from Fossil for some time, and now we've finally got it. Also on board is GPS, so there's no need to piggyback on your phone's signal to track runs, bike rides, walks or even go hiking. These fitness features are largely powered through Google Fit, but you do also have the benefit of third-party Wear apps to tap into. Swimmers are catered for, too, with waterproofing on both devices stretching to 3ATM. That means it can survive a dip in water up to 30 metres, along with splashes from shower. In terms of design, the Q Venture HR is the more female-friendly option, with a 40mm stainless steel case that houses a touchscreen display and comes in a variety of styles, along with interchangeable 18mm bands. The Explorist HR measures in with a 45mm stainless steel case and uses 22m interchangeable straps and likewise, is available in a range of different finishes and with different straps. Both watches are, of course, iOS- and Android-friendly, with Wear OS powering all things software and giving you access to Google Assistant and the Google Play Store. A Snapdragon 2100 processor powers performance alongside 4GB of storage, and battery life is set to be around 24 hours, depending on usage. All of the new Fossil fourth generation Wear smartwatches are up for pre-order now on the Fossil website. Prices range from $255 up to $275, depending on what case and strap combo you opt for. We hope to have our hands on the new Fossils in the near future, so stay tuned for our full verdict. We were actually pretty big fans of the third generation Explorist, while the Venture scored decent in our review, as well. Here's hoping the more feature-packed instalments can build on last year's models. No indication of what club is powering these watches. Are we to expect Qualcomm's 2100 as usual or will they be powered by something faster? They still look the part and I'd be tempted with the black Venture but it is sadly lacking storage for on-board music. I'd love to be able to go for a run without lugging a phone around with me. The article mentions it's a 2100 and there's 4GB of storage. Bad timing though, looks like Qualcomm is announcing the 3100 soon. No LTE? Damn! 30 ATM and GPS were almost too good to be true.